Geelong selected Nina Morrison with its number one pick in the AFLW draft on Tuesday. 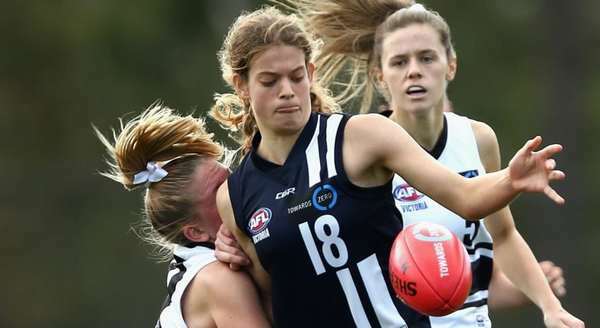 Morrison, who is described as a ‘ball magnet’, had a superb season for the Geelong Falcons at Under 18 level and was rewarded with being the first name called out in the AFLW’s third draft. The 17-year-old claimed nearly every award possible this year, as joint winner of the AFLW Under 18 Championships MVP and TAC Cup Girls Best and Fairest along with Vic Metro onballer Maddie Prespakis, who was drafted by Carlton at pick three. The Cats selected Sophie Van De Heuvel with pick number two. Van De Heuvel, who is also a gun cricketer, is a speedy half forward who can also play in the midfield. The Cats, who will field a side in their inaugural AFLW season next year, selected Rebecca Webster with their third pick, and seventh pick overall in the draft. Webster turned 18 the day before the draft and spent the season with the Murray Bushrangers, where she was captain. Webster is an aggressive defender who is also a good intercept mark. Olivia Purcell was picked up with Geelong’s fourth pick and number 14 overall. The local Geelong Falcons midfielder will provide Geelong with elite endurance running and a furious work rate. Speedy midfielder/forward Denby Taylor was taken at pick 20. Taylor is also a product of the Geelong Falcons and is good overhead. She was best afield for the Falcons in the TAC Cup grand final. Key defender Georgia Clarke was pick number 24 and the sixth name read out by the Cats. The 177cm Clarke is strong in one-on-one contests and will be given time to develop. Rene Caris was picked up at number 35 and will also be given time to develop. The 184cm Caris is a ruck who possesses excellent endurance. Geelong’s VFLW best and fairest runner-up Maighan Fogas was chosen by the Cats at number 47 overall. Fogas is a midfielder who finds plenty of the ball. Elise Coventry had a good season with Geelong’s VFLW side and was rewarded with a spot on the AFLW list after being selected at number 55. Coventry played 17 games this season to go with 13 in 2017 at VFLW level. She is the great-granddaughter of 1897 Cats player Jim Flynn. The final player selected by Geelong, and number 60 overall, was Madeline Keryk. Keryk has played AFLW with Carlton and was the club’s inaugural vice-captain, but the mature-age recruit was delisted and has now been given a lifeline by Geelong.